Today’s post is being penned in a local Starbucks that I was forced to take refuge in. I couldn’t stand the racket in my apartment as currently my bathroom tiling is being torn apart by a shady Eastern European father and son duo not unlike the father and son illegal cable installers on Seinfeld. I don’t say shady because they are Eastern European, but because literally the first thing they did was take the fixture off the wall and then scramble around in a panic as water proceeded to spray uncontrollably around the room. What do my apartment complex manager and Jurassic Park’s John Hammond have in common? Apparently, they have both spared no expense. 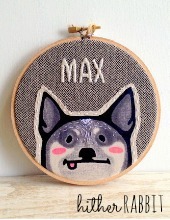 Today’s product is also of European descent. They’re from Poland. 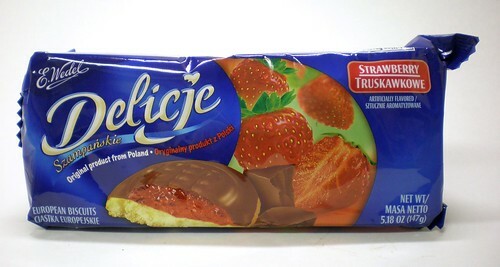 Delicje Chocolate and Strawberry European Biscuits. Delicje is an imprint of E. Wedel, which if you recall brought us this chocolate bar a few weeks back. As the box states, these are “European biscuits.” Now, I always thought that a biscuit was the British equivalent of a cookie. But through the power of the internet, I discovered that these European biscuits are actually “Jaffa cakes,” which is awesome because my first exposure to that term was through the British show Spaced (best show ever). Real world/pop culture crossovers are magical. Remind me to tell you about the time I met David Letterman at a Steak ‘n Shake. True story. 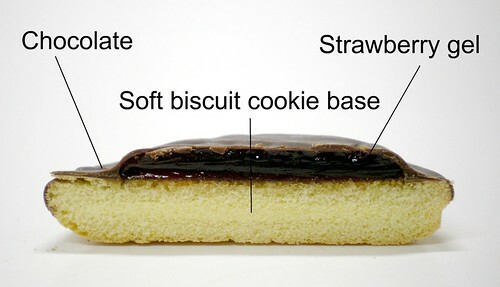 A Jaffa cake (Jaffa is a type of orange the original product was named after) is either a cake snack or a biscuit snack depending on who you ask. 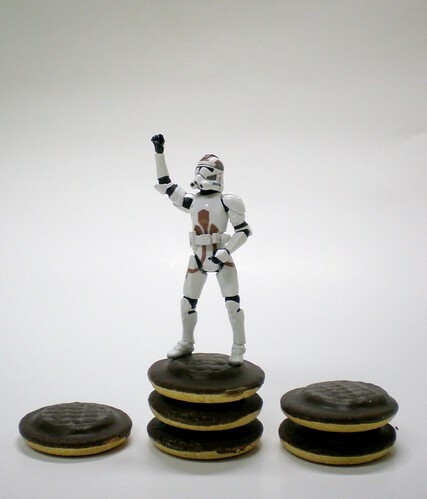 In the UK, chocolate-covered biscuits are taxed more than chocolate-covered cakes because biscuits are considered a luxury item while cake is just considered to be food. Don’t tell me that’s not the best thing you’ve read this week. 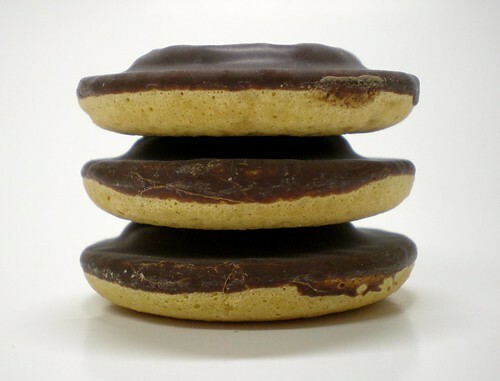 The head of the McVitie’s, the company that introduced Jaffa cakes, lobbied before a tribunal (I hope hooded robes and gongs were involved) that Jaffa cakes were indeed cakes, even going so far as to bake a giant 12 inch one to further his point. One of his arguments was that biscuits get soft when they go stale, but cakes get hard. Don’t tell me that’s not the second best thing you’ve read this week. This diabolical Matlockian genius won the trial, and now as far as the UK government is concerned, a Jaffa cake is a cake. But turns out the hoi polloi aren’t buying that. The majority of Britlanders still deem them biscuits. I am comforted to know that the United States is not the only country that spends a lot of time arguing issues of such national import. Britain, we’re not so different you and I. The biscuit base itself is more or less flavorless. It’s fairly dense and a little crumbly. It really just adds mass and acts as a platform for the gel and chocolate. That layer of chocolate is thin and crackly and decent enough for its purpose. The strongest flavor is easily the strawberry gel. It’s bright and a dash artificial but overall it works. The only thing that weirds me out is the solidity of the gel disc. All in all I liked them a lot. They went great with my coffee, and once I figure out what exactly “tea” is, I’ll try them with some of that too. God save the Queen (of Poland)! Delicje, while not the world’s most appealing cookie, were always a sure fire way to get my 4 year old cousin to do what I wanted. Therein may lie their true usefulness. Oh yes theyre like a strawberry jaffa cake! Hvae you had the original ones yet? Mcvities sometimes bring out limited edition flavours for certain seasons as well, they brought out “spooky lemon & lime” for Halloween last year. I was trying to find out where the Delicje biscuits were actually made. The packaging we have in the U.S. doesn’t say imported from Poland.